Coming into Game 4, I had a strong feeling we were going to see what we saw Sunday afternoon. Without their best player in Yao Ming able to play because of another hairline fracture in his foot, a Rockets team came out like a cornered animal and shocked LA and the rest of the league, tying up their series at 2-2 with a 99-87 win. It wasn’t even that close as the score would seem. If Houston’s Game 1 victory over the Lakers was a fluke of a win for Houston after a 7-day break for LA, then Sunday’s game must have them officially concerned. Could there be visions of the last year’s Finals against the Celtics, or the 2004 Finals against the Pistons where they were heavily favored then got blown off the court, be entering their mind now? 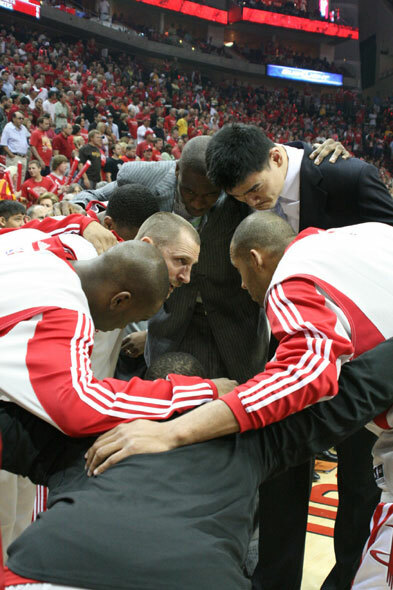 What a strange sight with Yao, Dikembe and McGrady in street clothes in the pre-game huddle. 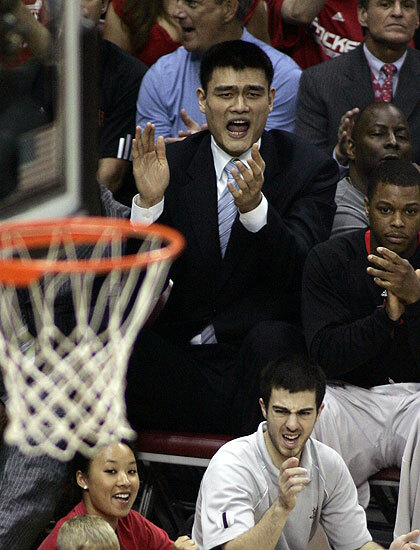 Click here for more photos of Yao and Dikembe on the bench. The Rockets came out strong Sunday from the opening tip, went on a 9-0 run, built a 289point lead at one point, and never looked back. The Lakers closed it to within 13 points in the 4th quarter when the Rockets got careless with the ball (4 turnovers, when before the quarter started they only had 7 total) and were outscored 33-16. But their 29-point cushion after three quarters was so overwhelming, the Rockets eventually righted the ship and closed it out. Yao cheers on his team in an amazingly electric game for his teammates. Click here for photos of his teammates in action. Even though this big victory doesn’t surprise some people, every Rockets fan still has to be very proud that they continue to bounce back from so much adversity this season with Carl Landry getting shot, and McGrady, Dikembe and now Yao out. We all knew they would play hard, but to have to adapt so quickly with a new gameplan after finding out the night before that Yao wouldn’t be available is remarkable. I had been wondering after Game 1 why Aaron Brooks, who had torched the Lakers with 19 points, was almost a non-factor since then. I thought if anything was going to get him back to his Game-1 self, this was the opportunity since Yao’s absence and the spreading out of the offense would open up more lanes through which he could drive to the basket. Get him going by attacking the rim, and before you know it, the 3’s might start falling, too. Like clockwork, that’s what happened. Brooks was baaaack with a playoff career-high 34 points on 12-of-20 shots, including 4-of-9 from three-point land and 4 assists. I’ve never seen a Rockets player who is almost impossible to contain like Aaron is because of his quickness and dribbling prowess. Brooks was able to expose Laker point guards Derek Fisher (2 points) and Jordan Farmar (7), getting just about any place on the court he wanted. Heck, throw in Kobe Bryant‘s 15 points on 7-of-17 shooting, and Brooks still outscored 3 of their starting guards combined. Brooks had one of the most athletic plays I’ve seen from a Rocket since Von Wafer‘s reverse dunk near the end of the regular season against Portland: an alley-oop from Ron Artest on an inbounds pass from halfcourt to Brooks, who caught it in mid-air, suspended himself like Michael Jordan with some major hangtime, and laid it in off the glass! Sportscenter Play of the Day anyone? Throw in Shane Battier having the playoff game of his life, 23 points including 5-of-10 3-pointers. With Brooks’ 4 treys, Houston shot 10-of-29 from beyond the arc, setting a playoff high this season for 3-pointers made in a game. Battier would later say he has been open all series long, and was a quote machine in his post-game press conference. I’ll have that audio up on the site in the next day. Brooks would say after the game about Battier: “He came out and gave us a spark and defensively he did his thing. That’s the heart of the team right there.” Wow, that’s saying something on a team that has lots of heart. Because of that kind of defense, the Rockets held the Lakers to 36 points in the first half, their lowest scoring half of the season. You’ve got to give credit to the Rockets for showing what they’re made of against a high-profile team like the Lakers when their own high-profile guy in Yao is out. What’s amazing is that the Rockets didn’t hardly get any scoring from the guys who I thought would come out on fire. Not that they didn’t play hard, because they all did — especially on defense with this kind of effort — but they only got 8 points from Ron Artest (4-of-19 shooting, including only 1-of-8 in the 4th quarter), Von Wafer only had 4 points, and Carl Landry had two points. Luis Scola chipped in 11, but he was only 4-of-11 from the field (but grabbed a playoff-career-best 14 boards). Chuck scored his obligatory 2 points. And even former Laker Brian Cook even got into the act for the first time when it really mattered, hitting a three that brought the house down. There was alot of ‘house’ coming down Sunday afternoon at Toyota Center. I couldn’t keep up with counting how many times the crowd was on their feet and blowing the roof off the joint. And they responded by booing loudly whenever Fisher had the ball, or Kobe or Lamar Odom committed a foul. They did their job, helping scrap out this win. Kyle Lowry, who scored a playoff-career-high 12 points and had two assists and two steals, was responsible for some electrifying moments himself, taking the ball coast-to-coast on one possession, going strong to the hole, getting fouled, then banking it off the glass Kobe-style. The Lakers have to be worried even a little bit more now since Odom took a hard fall on his back, thanks to great defense by Battier, when he was called for a charge, laid on the floor for a few minutes, and had to leave the game because of back spasms. It must be strange for Laker fans, who must have been giddy when they heard Yao was out for the season thinking they had this thing wrapped up, to be tied 2-2 and have Odom be questionable for Game 5 on Tuesday. I’ll have plenty more on Monday with some further analysis and lots more audio from the locker room and press room. This entry was posted on Sunday, May 10th, 2009 at 8:57 pm	and is filed under 2009 NBA playoffs, vs. LA Lakers. You can follow any responses to this entry through the RSS 2.0 feed. That was a bitter-sweet victory. Bitter in that poor Yao was not a participant in it, and sweet because it was a convincing win for the Rockets. I wish Yao's teammates played like this in the previous game and the one before. If they had played like this, Yao probably didn't have to play over 40 minutes a game or played that hard which could have contributed to his play-off ending injury. I hate to say it, but I think Yao's presence makes them less aggressive. The heart of a champion. After Game one, Pau Gasol: “… It’s tough to play worse than that.” Oops, should have waited a few more days… The worst will come soon, Pau! Wow, what a great win! Rockets are playing a brand of basketball I've never seen before, so much movements, and seemingly everyone's open to take a shot. Lakers must be feeling the pressure, like you said John, Lakers don't cope well with pressures. This series never seizes to amaze me with all the drama! AB is got made hops, he's growing up fast! Ten years down the road, kids will love it … another NBA classic. The last shot of the 3rd period between Artest and Brooks … Play of the playoffs. T.J. Simers from LA Times: “I can tell you now it was Mother's Day and the way the Lakers played, only a mother could love them.” T.J. I'm not sure about that. One of the best games I’ve seen in a long time. thats because they all depend on yao….